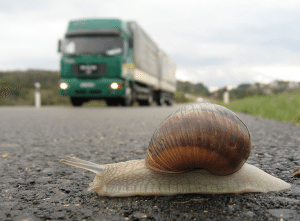 Are You Slow Enough to Succeed in Social Media? Within 12 months of its invention, 1,200 companies entered the radio “business” in some form or fashion. So said Malcolm Gladwell in a stirring speech given Monday to the AAA Annual Meeting in Scottsdale. In his own, story-filled way, he emphasized the point that we are in a period of unusual communication change and upheaval, not unlike the 1920s and the invention of radio. But he also made the point that counter to popular opinion, change doesn’t occur gradually, it occurs with sudden, breathtaking swiftness. Social media adoption is happening at an extraordinary rate, and I believe every company will have some sort of social media presence within the next 24 months. This is an adoption rate far steeper than it was for websites. But, social media speed is illusory and misleading. Yes, thanks to social media, business is faster than ever. But it’s also slower than ever. The fundamental premise of social business is that you are interacting and engaging with customers and prospects on a one to one or one to few basis. And that takes time. Trust takes time. Creating advocacy takes time. You build a volunteer marketing army one soldier at a time, not overnight. Social media isn’t about quickly building weak bonds between a company and large portions of its customer base, it’s about slowly building strong bonds between a company and a small portion of its fan base. It’s up to all of us to redefine what social media “success” looks like, to focus our efforts on building kinship day-to-day, and yielding sustained passion for the brand. Social media isn’t a grenade, it’s a bayonet, and if we fall into the trap of focusing on “When” instead of “Why” we’re going to end up as a historical footnote – a curiosity worthy of a Malcolm Gladwell speech someday.